Sculpted of an unusual beauty, feet always bare and head full of curiosities, his gaze imbued with thoughts of poetry, today the ex-king Aragorn will delve deep into the cerebral meanderings of Cronenberg while promoting A History Of Violence. 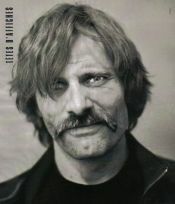 Viggo, author, painter, editor, dreamer, polyglot, photographer ... and actor, is a man apart in the cinematographic world. A meeting with him at the Croisette. Ciné Live: Do you think that landing a role like that of Tom Stall in A History Of Violence was sheer luck? VM: I don't know. I'm not sure I believe in that kind of thing...but it's possible! I believe more that as we get older, as we look back, we'll realize that perhaps there was one crazy year, another full of anguish, etc, but you can never really say why things occurred at that precise moment. Just like you can never know what will happen tomorrow. Looking at it in hindsight, it's like by merely leafing through the pages a novel that might have its own logical style of organization; you might not understand the book. Maybe when I'm 80 years old, all of this will make some sort of sense, but not just now...I'm not sure of being in control of everything. It's far from being evident. Ciné Live: At the beginning of the film, Tom and his family seem happy, while at the same time they seem very alone, each living in their own world. They don't really come to life until the violence takes place. VM: It's true. But the film also speaks to the question of identity, authority. A masculine authority provided by a man or woman at the heart of a family, between two people, at the heart of a town of a country. The film talks about the rapport that people establish, or fail to establish, between each other. In many cultures, the most common model of authority is often masculine. The question posed is of knowing what influence may be had on a person being told what to do, as well as what influence is had on the individual giving the orders. In both cases, you're impeded from expressing yourself completely, totally. It's like a censor, an auto-censor. This film also asks about the opinion of others, the opinion that they have of you based on acts that don't reflect your personality. For we always hide something from others. After the incident, the people of the town congratulate Tom for his actions, they thank him for getting rid of the intruders, all while remaining ignorant of who he really is. He passes for a hero, for someone who has made the right decision, and all of a sudden they're deferring completely to him. That's how we wind up renouncing our rights, particularly the right to self-expression. That can open the door to dictatorships and to terrible acts. Ciné Live: Like unjust wars? VM: Yes, because people today no longer think for themselves. We tell them what to say, what to think. They rely on others. In the movie, whatever Tom asks of people, they do. It's a movie about the manipulation of the subconscious, how it affects our daily lives, our personalities. But I don't think that A History Of Violence really is a political discourse. Some will say some truly stupid things on the subject. Their laziness will lead them to say that it's a film about violence, about violence in the US, which is wrong. It's a film about being human. Violence is only one aspect, an expression of authority with a capital A.
VM: Maybe. This film does definitely talk about that. It doesn't use the Bible, the Koran, or other books to justify who we are. Campbell likes to use metaphors. After you tell a story or write it down, it is dead. It's necessary to retell it in a manner that will speak to your particular culture, your personality, your knowledge. This film talks about identity and the manner in which it can be affected by any number of events. Ciné Live: Upon arriving in Cannes this year, George Lucas declared that on his first trip here, 30 years ago, the war was happening in Vietnam. Today that war has been replaced by the one in Iraq. Would you say this means that we haven't made any sort of progress? VM: No, there's been some. History will be the judge. One of the reasons that I'm filming a movie in Spain (Alatriste, about a Spanish soldier in the 17th century), is that the period it's set in hasn't really been made a movie of before, and it can in some ways allow us to explain what is happening today. The Empire of the era, which was one of the most important in the world and lasted more than 150 years, resembles the America of today. Just one example: Soldiers were persuaded to fight for causes that weren't theirs, that had no reason to be, like Vietnam or Iraq. So do we learn from history? Not really, since some people never want to learn. Ciné Live: Is that to say that by playing the role of Captain Alatriste, just as you played the role of Aragorn in Lord Of The Rings, you are better able to understand who we are today? VM: Without a doubt. I believe it. With Lord Of The Rings, certain American journalists declared in a peremptory manner that it was about violence in America, just like with History Of Violence. As though it was so simplistic. They viewed the movie as the story of America and the coalition of Good versus the Arabs. That's what was written and printed in Newsweek and Time magazines. Incredible! Ciné Live: By making Hidalgo would you have liked the movie to help certain Americans to better understand the Arab culture? VM: Yes, as Hollywood often represents them in a humiliating manner. With such a prominent film, I wanted to show that we can come to terms with our differences, also to show the similarity between the behavior of cowboys towards American Indians and this attitude we have towards the Arabs. It's intolerably self-important. I think that we should learn more from the Indian culture, and from others. Ciné Live: How did you become a painter? Ciné Live: Have your paintings evolved over the course of twenty years and if so in what sense? VM: I hope so! They are, I believe, less tortured, simpler. VM: Who knows. I'm not certain that I could have made History Of Violence ten years ago. You have to go through some pretty strong things and, during that time period, I wouldn't have been able to bring the nuances that David Cronenberg liked. Today, I impose a real discipline on myself when bringing a character to life. If you see the movie a second time, you see new aspects... In constructing the characters on paper, we connected with them in a subconscious manner that may or may not have been visible to the audience. Ciné Live: As a boy you were a little rebellious. You often ran away from home. Is that to say that you lived in a bubble, with only your imagination for a companion? VM: I wasn't an only child. I had three younger brothers, and it's true that I had a need to be alone. I was happy that way. I still am today, even if now it's harder to achieve. If I don't get some time to myself, I don't do very well. I'm not particularly at ease in public. For example, here in Cannes, I'm far from being in my element. If only because of the creativity missing, taking shape on canvas or on a screen. Some people are terrified of the idea of being alone and they need to make phone calls, they need to talk, to turn on the TV for company - silence frightens them. I live differently. I'm not saying my way's better! Just different. But it's vital for me. VM: Maybe. But we are also all human beings. For example, my brother in the movie, portrayed by William Hurt, and his associates believe that Tom is still the same man he was at age 20, that he's never changed. Wrong. Tom has changed. And that is true of all of us. We can change, thankfully. We're told that Americans can't change, like the French. Of course we can! Some, simply, don't feel the need. You also perhaps have the need to change. That's why I wanted to work with David Cronenberg. Apart from the fact that he's a legendary director, he wants - and directors like him aren't common - that the public think for themselves, reflect, and doesn't find itself with a papier-mÃ¢ché discourse. But not just the 'public' in general. No, each spectator. The majority of directors want to tell you what to think, and often the public is relieved, as that's much easier. They leave the same as they came in, without having been shaken in a good sense, without asking themselves questions; they're thinking that the dialogue wasn't bad, that emotions were conveyed well. Many politicians, so as not to say all of them, don't want people to think for themselves. That's dangerous. For a director as well. Imagine that the public, after reflecting on things, decides it doesn't like the movie. Horrors! (laughs) Cronenberg wants the public to question, without giving them ready-made answers. Living in a free world, he can do this, since the public can choose not to see his movies. Cronenberg gives you the possibility to ask yourself questions. If you're interested. Ciné Live: Would you say that the two of you connected so strongly because you have a lot of things in common, like a predilection for self-reflection? VM: In discussing philosophy with him, I discovered that we were on the same wavelength, on a similar frequency. That we asked ourselves questions about human beings. We can talk for hours. We don't like the comfort in which society wants to plunge us. Especially that. That would be frustrating, unpleasing, emotionally, intellectually and artistically (at the same moment, David Cronenberg arrives with his photo equipment slung over his shoulder and fires away at Viggo) I also like his way of working, because he asks you to ask yourself questions. Here again, it's without giving you automatic answers. He has a creative process that suits me, that compels me to go further. I remember going to see Dead Zone in Philadelphia in 1983, the day it first came out. I remember as though it were yesterday. Details in the scenery, the character of Christopher Walken questioning his identity, already, about the structure of family and history. Cronenberg was like a companion on the road for me. Ciné Live: It seems that one day soon you'll be directing (he has written two screenplays). VM: I'd really like it, but it's important to choose good stories. I don't want to just say, 'Okay, I'm directing.' It's too much work, too much time, and life is short. The moment will come. I'm not in a hurry. It's important to be 100% ready. Ciné Live: Do you still wear the 'No More Blood For Oil' T-shirt you made yourself? VM: Definitely. I could probably wear it even more often. Particularly these days.